What is what in the Chamber? 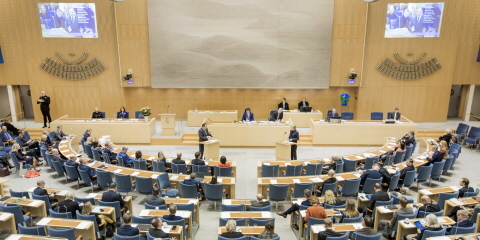 In the Chamber the members of the Riksdag hold debates on important issues and take decisions. The meetings are led by the Speaker or by one of the Deputy Speakers. 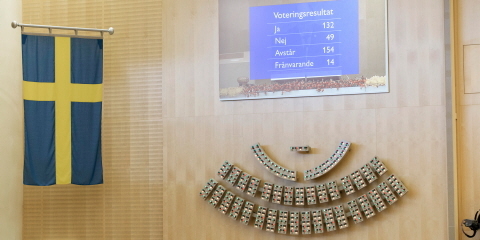 The 349 members of the Riksdag have fixed seats and sit according to their constituency rather than party, unlike the norm in many other countries. Sweden is divided into 29 constituencies. 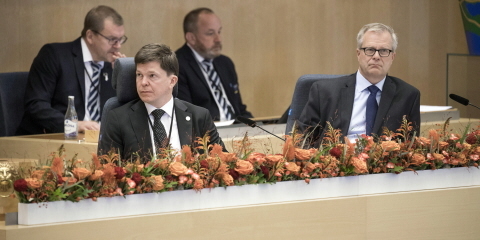 Members representing the Municipality of Stockholm sit at the front on the right, members from Norrbotten County sit at the back on the left etc. The members of the Government have their seats are the front to the left. These chairs are not equipped with voting buttons, since the ministers may not vote. 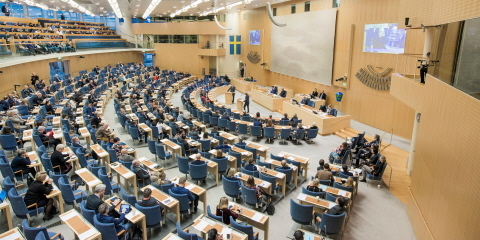 During debates, however, they may sit where they like, but the idea is that they should use the 50 special debating chairs arranged in a semicircle in front of the Speaker. This is designed to create an intensity during debates. Four of the debating chairs are used by the ministers attending the debate. During meetings of the Chamber, everyone should be neat and well-groomed. Outdoor clothing may not be brought into the Chamber. 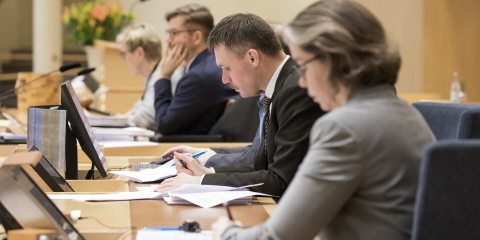 The meetings of the Chamber are chaired by the Speaker or one of the Deputy Speakers. The Speaker sits on a chair with an extra high back on the middle of the platform. The Speaker is not permitted to take part in debates or votes. The three Deputy Speakers have their seats to the left of the rostrum. Unlike the Speaker, they are allowed to vote in the Chamber, but may not participate in debates. 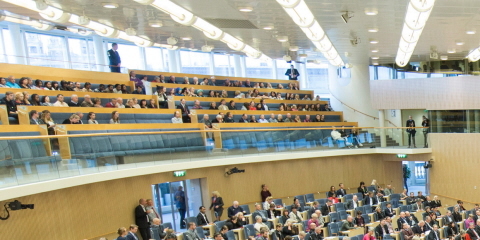 The rostrum to the left of the Speaker is where members of the Riksdag stand when they hold a speech. The rostrum is decorated with the national coat of arms, designed by Ingegerd Råman and Per B Sundberg. The rostrums in front of the Speaker's desk are, for example, used during debates between party leaders and interpellation debates. 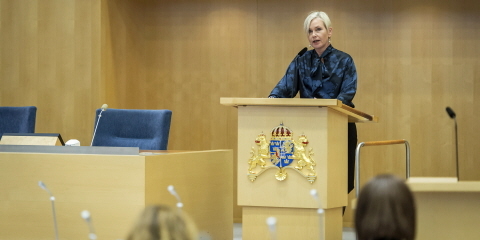 The clerk of the Chamber assists the Speaker during meetings and provides advice on matters such as the fundamental laws and the Riksdag Act. The clerk of the Chamber sits to the right of the Speaker. To the right of the clerk of the Chamber sits an official from the Secretariat of the Chamber and an official reporter of the parliamentary record. The official connects the microphones for contributors to the debate and manages the voting system and information boards. The official reporters of the parliamentary record write down everything that is said in the Chamber. This can be read the following day in the preliminary record. Assistants help with various practical tasks in the Chamber. They sit behind the clerk of the Chamber and the Chamber official. In the event of a tied vote during a vote in the Chamber, matters can sometimes be determined by lot. In such cases, the ballot box on the Speaker's desk is used. The artist K G Nilson crafted the ballot box using 15 different types of wood. On the wall there is a ballot urn which is used in the event of a secret ballot, for example for the election of the Speaker. 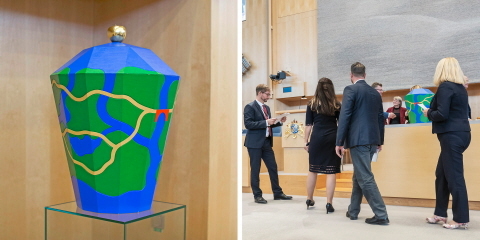 The urn was made by the artist K G Nilson and shows land, water and roads. The bridge unites the different roads and may be seen symbolically as an agreement. The apple on the lid is the fruit of knowledge. When a committee report is debated in the Chamber, the committee officials who have drafted the report attend the debate. They sit along the wall to the right. On the opposite side along the left wall there are seats for officials from the Government Offices. When government ministers are to speak in the Chamber they are often accompanied by officials from their ministry. The projector screens on the wall behind the platform are also known as information boards. They show the item of parliamentary business that is being debated, who is speaking, or the results of a vote. 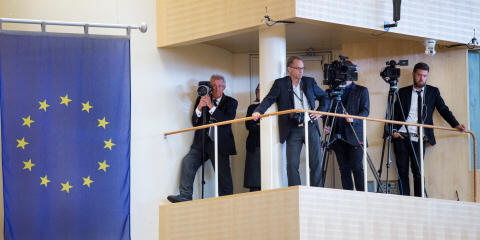 It is also possible to show moving images and information from the Riksdag's in-house broadcasts. The voting displays, showing how each member has voted, are under the projector screens. Each of the lights on the board represents a member's seat. A green light for "yes", red for "no" and yellow for "abstain". If a member is absent, the corresponding light will be out. The tapestry on the wall behind the platform is called Memory of a landscape and was created by the textile artist Elisabet Hasselberg Olsson. It is 54 square metres in size and is woven from flax from different parts of the country. The tapestry depicts an imaginary landscape that could be found anywhere in Sweden. Behind the window above the tapestry and along the left wall there are offices and studios for the media. Seats are reserved for reporters and photographers at the southern end of the Public Gallery. Photographers can also take photographs from the balconies, on either side of the platform and from the photo openings on either side of the tapestry. Behind the windows along the right-hand side sit the media technicians. They ensure that all meetings are filmed. The technology is used for in-house and external television broadcasts and webcasts. 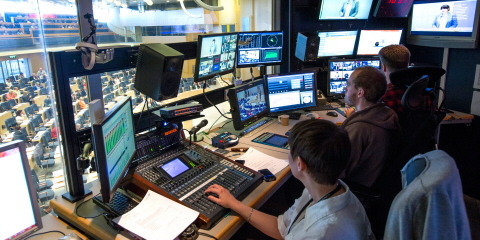 Broadcasting companies can link up to this service and broadcast from the Riksdag free of charge. Anyone who wishes can attend meetings of the Chamber and sit in the public gallery. All debates can also be watched via the Riksdag webcast service. Some debates are also broadcast live on radio and television. The contents of debates can be read the following day in the preliminary record. There are certain rules of procedure for visitors to the public gallery. Manifestations, demonstrations and applause are not permitted. Photography is permitted, but not using a flash. Taking close-up pictures of notes or documents on members' desks or on the platform is prohibited.